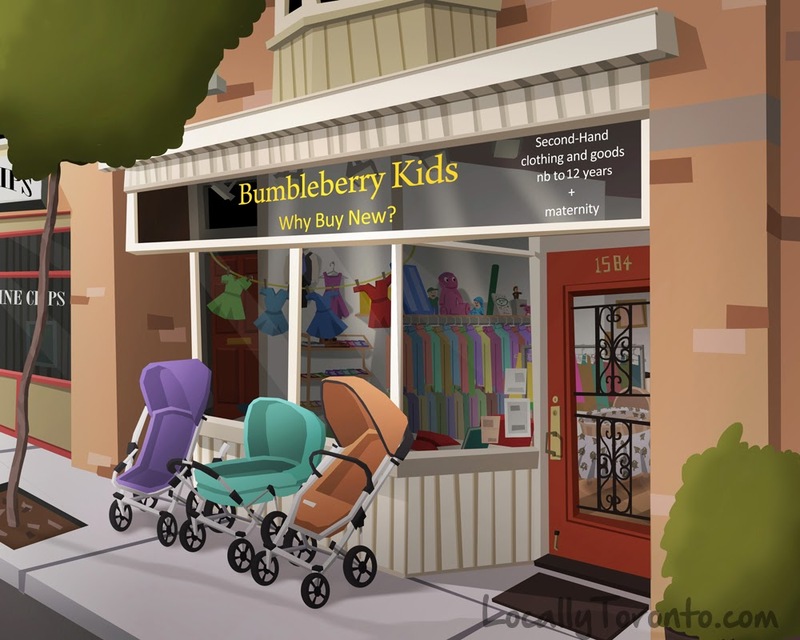 Recently moved: Bumbleberry Kids is now located further down Queen St E closer to Coxwell Street. They still offer all the same great services, including new and gently-used clothing for nb to children 12 years of age. You'll find a lot of brand-names ( see more info here: http://bumbleberrykids.blogspot.ca/p/needs-and-likes.html) and they love to have people bring by their own good-condition used clothing for store credit. The shop itself is very cozy and has a lot of charm. 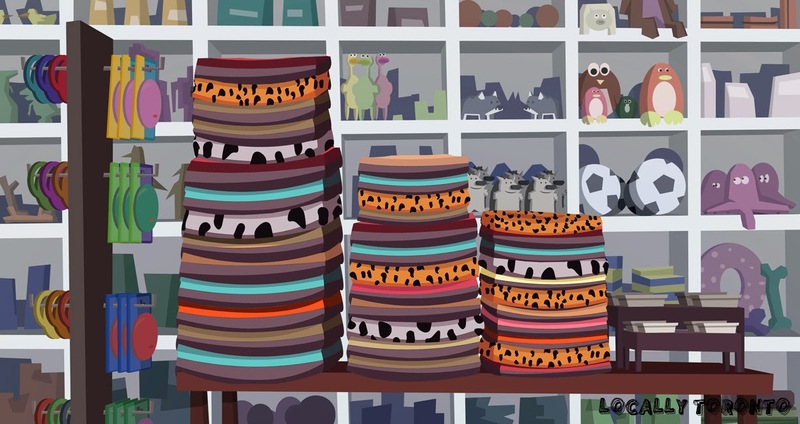 It is larger than the last location and can carry more merchandise. 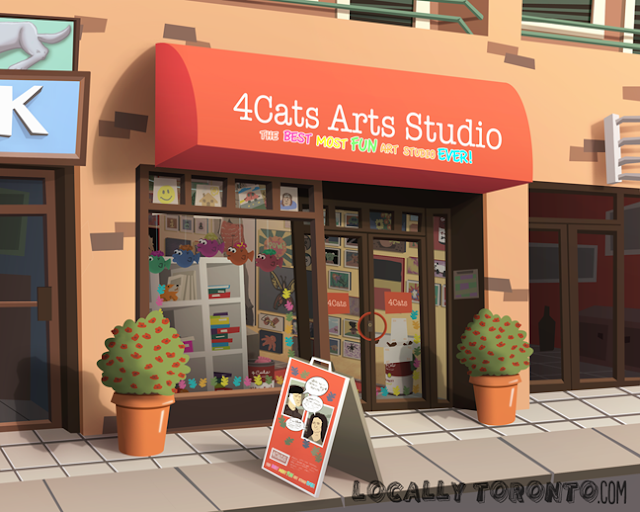 If you find yourself in the neighbourhood, why not pay them a visit? Creamy Craft of Cosmetic Making is one of the many classes offered by Aroma Shoppe. 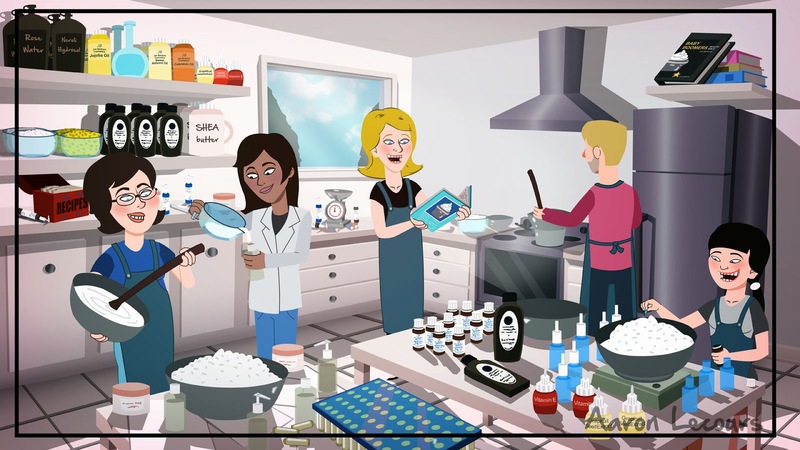 This is an illustration of the many processes, including putting essential oils into the creams, pouring the creams in the bottles, cooking over a double boiler and whipping the creams. Of course the creams can be used for many things: skin lotions, creams, ointments and lip balms are probably the most common. The classes are taught in a fun and hands on way, and are perfect to begin your own approach to Creamery Crafting. 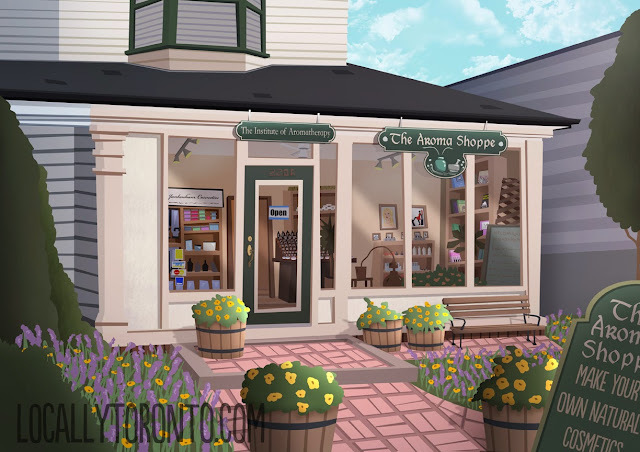 This is an interior of the shop I previously uploaded, Aroma Shoppe. These illustrations are part of the new site layout, where it will be a click-able cartoon store. 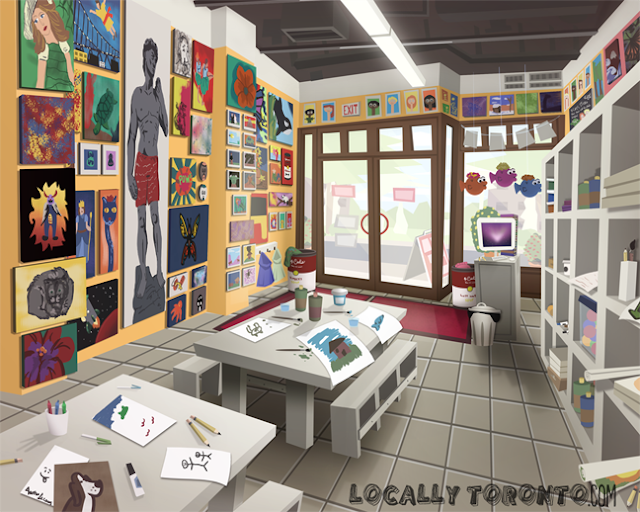 This was a truly a one-of-a-kind store, filled with plenty of make-up products and make your own cosmetics. Both eco-friendly and all natural. Not to mention the books on the same subjects, essential oils and kits. Now it's a one of a kind site. It was also an international school with plenty of people travelling from all over the world especially Japan to train in Aromatherapy and Holistic Studies. 4Cats recently moved, and with the move they asked me to tackle their studio once again. This time I had more freedom, as it didn't need to be apart of a long strip. 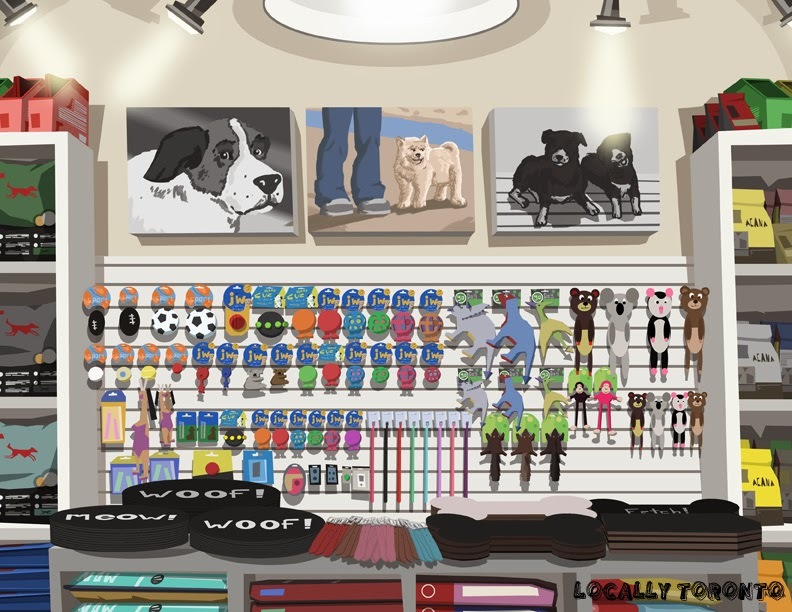 I also was asked to do the inside of the shop, which may be my most detailed piece yet for the site, with all the pictures and art on the wall. As mentioned in my previous post about 4Cats, they offer many courses for children and adults on the fandamentals and not so fundamentals behind art. 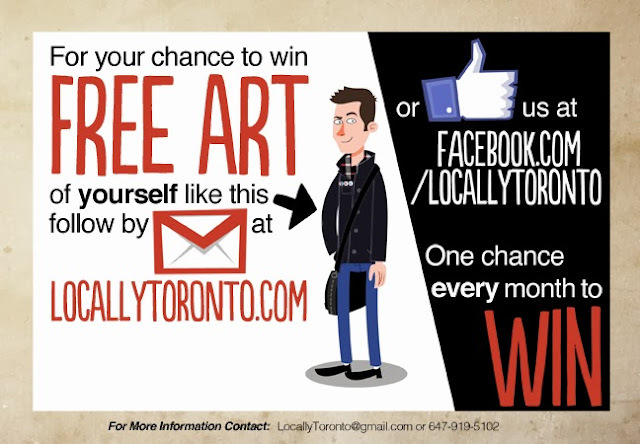 Starting in November, every subscriber of www.LocallyToronto.com and fans of our Facebook page will have a chance to win free art (a fancy cartoon of yourself or whoever you like!). So make sure to subscribe and like our FB page to maximize your chances of winning! Best of luck to you all! 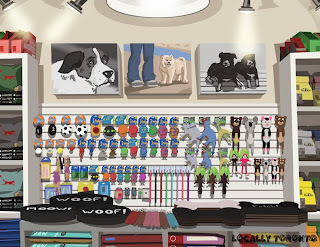 The Dog Market asked me to draw the inside of their shop in the same way I drew their store front. 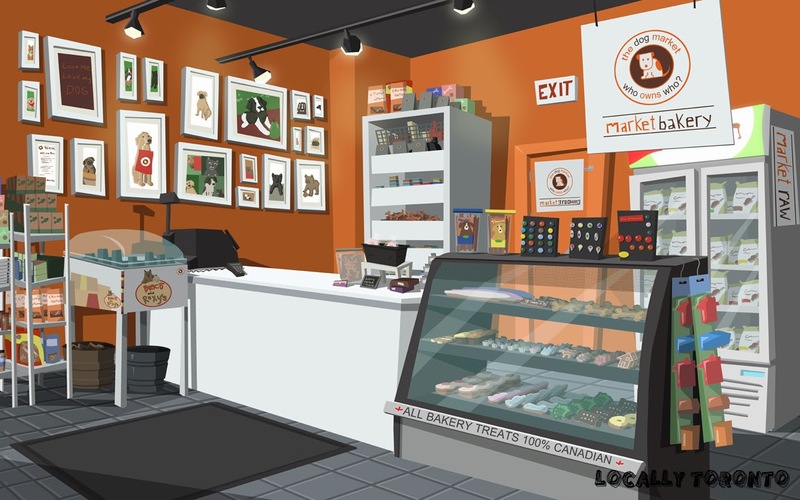 I came up with 4 shots that I believe represent the shop in all its animal glory. The first shot is of the counter, where all the delicious dog treats are sold. 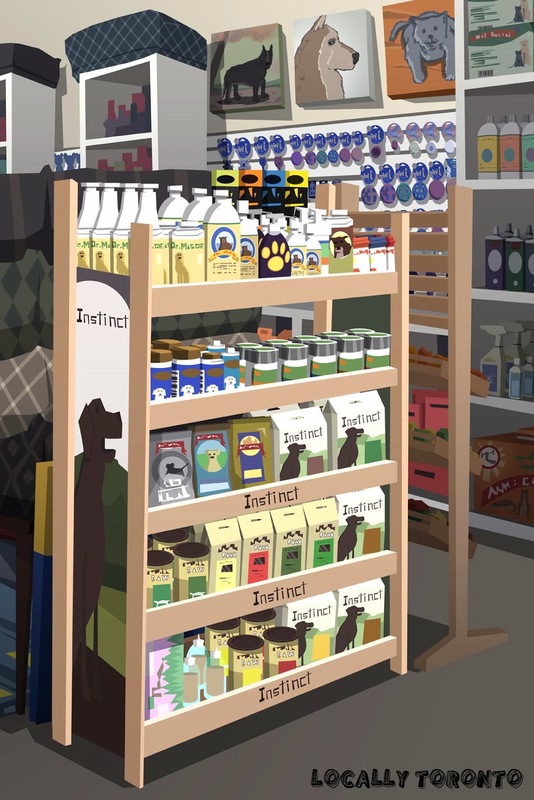 The second is of their products and leashes, while the third shows a stand full of dog food. 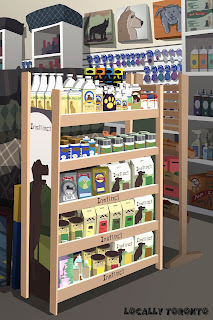 The last shot shows an array of dog beds, leashes and bowls.